Shiraz, Syrah, Petite Sirah: What’s in a name? Shiraz. Syrah. Petite Sirah. These wines sound similar leaving people confused about the difference between the three of them. Syrah and Shiraz are the exact same grape, much like Pinot Grigio and Pinot Gris are also the same grape. So, whether you’re drinking a wine called Syrah or a wine called Shiraz, the wine is made from the same grape. In France, the grape is called Syrah, while in Australia the grape is called Shiraz. In South Africa you get both! Generally speaking, if your label says Shiraz (as above), the wine is from Australia or South Africa. Most producers around the world follow the French and call the grape Syrah (right), but there are a few exceptions. Syrah is pronounced sih-RAH. Shiraz is pronounced sher-AS (rhymes with jazz). Although Syrah and Shiraz are the same grape, stylistically they make very different wines. 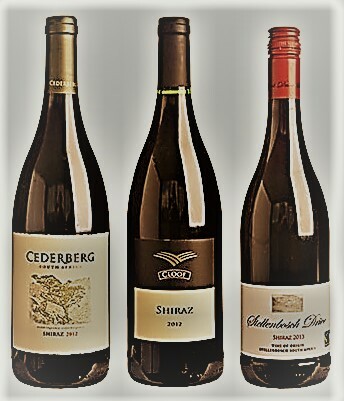 The majority of Australian Shiraz tends to be extremely fruit-forward, with very ripe, almost jammy fruit flavors. However, more elegant, restrained styles of Shiraz are being made by smaller, boutique producers. 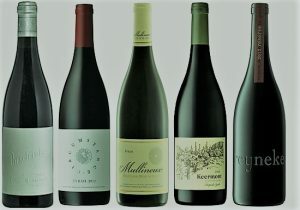 In France, the Syrah grape is the star of the Northern Rhône Valley, where it tends to produce wines that offer darker fruit flavors balanced by savory notes, like cured, or smoked meat. Keep in mind that these are generalizations, and that style depends on many factors. Petite Sirah, on the other hand, is an entirely different grape than Syrah/Shiraz, although it sometimes gets confused because Sirah is pronounced the same as Syrah. Adding to the confusion is the fact that the rest of the world calls Petite Sirah by its original name, Durif. A California winemaker named it Petite Sirah for marketing purposes. Stylistically, it is a grape that produces big, luscious, inky-black wines with tons of dark fruit flavors. So, no more confusing Petite Sirah for Syrah/Shiraz, okay? They are different grapes!